The super low-cost carrier JetBlue announced recently that more of its longer flights would be getting new fresh food snack boxes available to purchase. 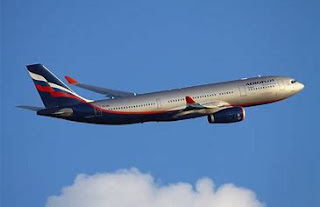 The US airline says it will now offer fresh food on select Latin America and Caribbean routes for the very first time. 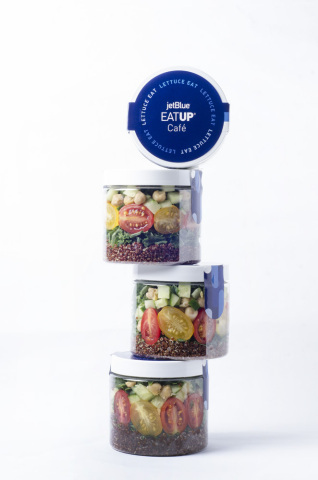 The airline is introducing EatUp Café menu on the flights which are already popular on domestic long-haul flights. These items will now be available for purchase on international flights longer than four hours departing from John F. Kennedy International Airport (JFK) and Boston Logan International Airport (BOS). Additionally this month, the airline introduced three all-new EatUp snack boxes featuring refreshed, curated treats for all tastes. Available on flights scheduled to depart between 5:57 a.m. – 8:59 p.m.
Fresh food is not available on overnight flights. Turkey & Pepper Jack Sandwich – This hearty snack helps keeps hunger pangs away with sliced turkey breast, pepper jack cheese, arugula and sun-dried tomato aioli on a rustic baguette. Ham & Cheese Croissant – Customers can stay full at 35,000 feet with sliced ham and fontina cheese on a butter croissant, with a side of Dijon mustard. Cheese & Crackers – This tray features a delicious medley of four cheeses: aged cheddar, brie, dill Havarti and baby swiss with dried apricots, a honey stick and sea salt olive oil crackers. JetBlue’s new EatUp snack boxes – FuelUp, SavorUp and PartyUp – are now available for purchase onboard domestic and international flights longer than two hours. The refreshed options offer delicacies for the most discerning foodies, and feature a variety of curated brand-name treats, allowing customers to indulge in their choice of high protein, Mediterranean-inspired or easily shareable snacks. JetBlue will continue to offer its signature PickMeUp cheese tray in addition to the three new boxes. PartyUp Ready-to-Share Snack Box – These ready-to-share snacks are perfect for catching up on your favorite shows and blockbusters. The box features Pop’d Kerns® sea salt popcorn, Fig Newtons, Old Wisconsin Natural Cut® salami slices, Whisps® parmesan cheese crisps and M&M’s®. Products may not be available on all flights and product substitutions may take place. JetBlue only accepts credit cards, debit cards or Apple Pay onboard.